ShingleVent® II ridge vent installs on the peak of the roof allowing exhaust ventilation all along the roofline -- end-to-end. ShingleVent II ridge vent has a low profile, shingle-over design that blends in with the roof. Once installed ShingleVent II provides exceptional attic ventilation and is almost invisible from the ground. Functional design and clean lines. For an air of distinction. Available with a bag of nails and without nails. Designed with an external baffle and internal weather filter, ShingleVent II delivers superior attic ventilation and weather protection. The external wind baffle directs airflow up and over the vent, creating an area of low pressure over the vent openings, pulling air out of the attic — even when the wind is not 100% perpendicular to the vent. The external wind baffle also deflects rain and snow over the vent, protecting the roof and attic from weather infiltration. An internal weather filter helps trap fine snow before it can enter the attic, and protects against dust and insect intrusion. This demonstration effectively visualizes the wind hitting the external baffle and creating low pressure above the vent openings on both sides of the vent to pull more air through the vent – much more air than thermal buoyancy allows. And, as the wind increases in speed, the vent’s exhaust airflow also increases. 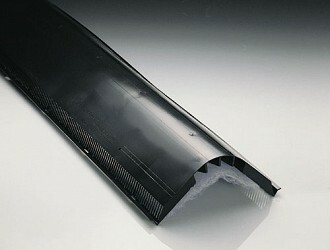 Eliminates the need for unsightly roof vents. External wind baffle design creates airflow pattern that actually “pulls” air from the attic and deflects rain, snow and insects. Unique filter system helps stop entry of rain, snow, dust and insects while allowing continuous airflow which prevents clogging. Strong but flexible in cold temperatures, stable in heat. 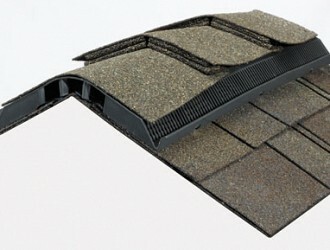 ShingleVent II-7 and II-9 come in an attractive charcoal color that coordinates with most roof colors. An external baffle creates low pressure over the vent openings to "pull" air from the attic. ShingleVent II provides 18 square inches of net free area per linear foot. Provides a more complete barrier to help protect the attic from wind-driven rain, snow, dust and insects. ShingleVent II has pre-printed slot guides for truss or ridge pole construction. Pre-drilled nailing holes are designed to assure proper nailing. The vent is pre-formed to a 4/12 pitch. 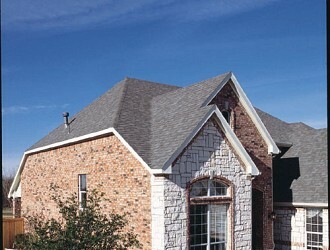 The same features as ShingleVent II, except that ShingleVent II-9 is 9" wide so that it can be used with cedar shakes or enhanced ridge cap shingles. Available in Charcoal. 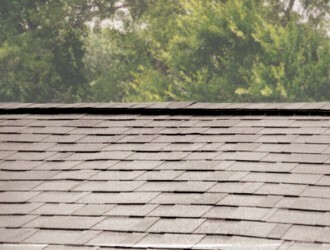 ShingleVent II-7 is 7" wide for use with narrow, enhanced ridge cap shingles. Available in Charcoal. ShingleVent II ridge vent combines beauty and performance with its low-profile design and proven airflow & weather protection results. Editor’s Note: Pictured here 7-inch wide ShingleVent II is installed on a metal roof using Country Manor Shake aluminum shingles by Classic Metal Roofing System. ShingleVent II is available in three widths: 7-inch, 9-inch and 12-inch. The opening at the peak is the missing plywood sections removed of the asphalt shingles at the ridge only. A single layer of asphalt shingles were left in place over the entire roof and covered with a special underlayment. Flatten coverable shakes to less than 1/16″ roughness or cover flattened rough shake surface with narrow 1.5″-wide flashing. Critical to installation is flattened aluminum shake surface roughness preparation and material long-term corrosion/erosion compatibility in conjunction with ventilation. If less than 1/16″ surface roughness is not obtainable, inclusion of approximately 1.5″-wide layer of flat aluminum flashing in between mating surfaces is preferred. Stainless steel pan head screws were used throughout installation. Editor’s Note: For this project the homeowner requested a new roof. The shingles were showing significant signs of deterioration. Upon inspection Bone Dry Roofing learned the current pitched roof was built over the top of an existing flat roof. There was zero intake ventilation for either of the two separate existing attics. The existing exhaust ventilation was 4 roof louvers. Bone Dry Roofing proposed ShingleVent II ridge vent for one attic that had a generous ridge length (25 linear feet) and a 30-watt solar powered fan for the 2nd attic (it only had 4 linear feet of ridge length available so a ridge vent would not work). The solar powered fan has a “Solar Controller” that allows fan operation without access to the sun if desired. Edge Vent was used as the intake ventilation. Editor’s Note: This project in Spring Hill, KS features an 1850s’ built house. G & G Restoration used ShingleVent II ridge vent (exhaust airflow @ horizontal peaks), Hip Ridge Vent (exhaust airflow diagonally) and The Edge Vent (intake airflow). Editor’s Note: Before Paul Davis Restoration got involved in this project the house had 3 roof louvers for attic exhaust airflow and ZERO intake airflow (vented soffit panels were installed but the holes inside the plywood were never cut). Mold growth was observed on the underside of the roof deck and on the rafters. For the fix, and after removing the mold, Paul Davis Restoration installed continuous vented soffit (intake) and a combination of horizontal ShingleVent II ridge vent with diagonal Hip Ridge Vent (exhaust). Editor’s Note: Makeover Masters originally contacted Air Vent seeking guidance for this project. JSD Sanchez Roofing did the installation. When The Edge Vent is used in a valley the slot stops 12 inches from the valley. Editor’s Note: ShingleVent II ridge vent is designed for roof peaks (horizontal). Hip Ridge Vent is designed for the hips of a roof (diagonal). “This project features ShingleVent II continuous ridge vent with The Edge Vent (roof-top at the eave) intake vents. Can you see them? Low profile, efficient ventilation will help to keep the attic temperature in check all year.” – Mike Lunsford, Owner, Lunsford Construction, Inc.
Editor’s Note: : The gable louver visible in the picture has been blocked from inside the attic to avoid possible short-circuiting of the exhaust vents (which can happen when 2 different types of attic exhaust vents are used on the same roof above a common attic). Using a transparent smoke house setup, this segment demonstrates the effective ridge vent ventilation of heat and moisture using the Bernoulli Effect with ShingleVent II. This segment highlights why a ridge vent’s Net Free Area rating is not the best indicator of the ridge vent’s actual performance. This segment examines how well or how poorly various styles of ridge vents minimize heat buildup inside the attic in testing conducted at the University of Illinois. This segment highlights how well a ridge vent designed with an external baffle uses the wind to its advantage to pull more air out of the attic in testing conducted at the University of Florida. See the Bernoulli Effect for yourself! This segment examines the weather protection capabilities of various styles of ridge vents in tests conducted at Architectural Testing Labs. You won’t believe the amount of water some ridge vents allow into the attic! This segment simulates 10 years of wind-blown dust exposure for various styles of ridge vents and measures the impact the dust has on the ridge vent’s airflow performance. Once and for all: Does Air Vent’s internal weather filter clog? No, and here’s the proof. This segment highlights footage of Class A rated 7-inch wide and 9-inch wide ShingleVent II ridge vent passing UL’s most stringent fire resistance testing: “Spread of Flame” and “Burning Brand.” Class A is a requirement in areas where wild fires are common. This segment examines the design and density of various styles of ridge vents and measures their actual airflow performance in tests conducted at Architectural Testing Labs.